That annoying, trickling, never-ending sound coming from your powder room can only mean one thing. It seems your toilet may have just developed a mind of its own and will not stop running. No need to panic, with these simple steps you can find a short-term solution to your toilet troubles. A common culprit to check out first is the flapper, which is the rubber stopper that lifts and allows water to fill the toilet bowl. Over time the flapper can wear and cause leaking through a compromised seal. If a replacement is in order, a simple trip to the local hardware store can have you back home in no time prepared to solve the problem. Note: There is more than one type of flapper on the market so be sure to purchase exactly what you have now to maintain the integrity of your entire system. Remember when your Dad told you just wiggle the handle and the toilet would stop running? There’s a simpler solution and yes it does actually involve the handle. Take a peek at the chain connecting the flush lever to the flapper and determine if an adjustment is needed. The chain is too short if it continually pulls at the flapper and too long if it prevents the flapper from closing. Adjust the chain as needed and the water should stop running. The floating ball in your tank is responsible for maintaining a consistent water level. If the float is too high, the optimal water level is exceeded and the tank will continually drain. A simple adjustment of the float arm or mechanism should solve the problem and regulate the water level back to the desired amount. 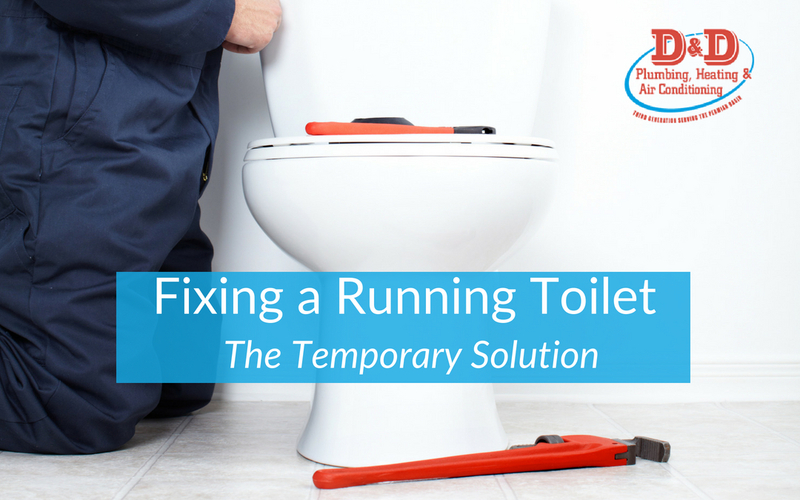 Toilet trouble is often unpleasant and sometimes even a bit unnerving, especially when constant running water is involved. Any of these tips can provide you with short-term relief but your best bet is to call in the pros for a full diagnostic assessment and repair that will provide a long-term solution. Contact us at D&D Plumbing, Heating, & Air Conditioning, specializing in superior service and complete customer satisfaction since 1989.